Interested in Egyptology? You can now become a “citizen scientist” and help do fieldwork without even leaving your house. 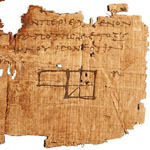 The Oxyrhynchus Papyri are a vast collection of fragmentary documents recovered from an ancient Egyptian trash heap. They’re mostly written in Greek, they’re mostly in pieces, and there are a heck of a lot of them. They’re a massive trove of information about everyday life in the 1st to 6th Century CE, but researchers face the very daunting task of both piecing them together and translating their contents. That’s where you come in. The Ancient Lives project has turned this task into a sort of puzzle game, where you can examine digitized fragments of the collection. You can measure the fragments–which will eventually aid in reconstructing the documents they’re from–and you can also transcribe their text by clicking on individual letters and then choosing their match from a floating keyboard of Greek symbols. No knowledge of the language is required; all you have to do is match the shape. Incidentally, I have a strong suspicion that this kind of decentralized “crowd computing” is the next big thing in scientific research. Although artificial intelligence has come a long way, the human brain is still superior for many important kinds of reasoning. Casting tedious-but-important tasks in the form of a game is the pefect way to get a lot of laypeople to happily help out. Anyway, as the papyri in the Ancient Lives project are reconstructed and translated, they’ll be published in the Egypt Exploration Society’s Graeco-Roman Memoirs. I’m hoping that any venture which relies so heavily on computers will also eventually be available online.